The process of developing a new product is risky and expensive for a corporate conglomerate. It’s as much art as science, built on relentless customer research, an eye toward an eventual marketing campaign, and a splash of imagination. But now Amazon competitor Alibaba has a plan to disrupt that process using big data. According to a fascinating new Bloomberg story, the Chinese company is using its enormous heap of data about its customers to help brands develop new products. If the project works — and there are signs that it is — it could plot a new course for how products enter the market. Alibaba recently provided prominent customer Mars Inc. with a vast repository of data about Chinese consumers. 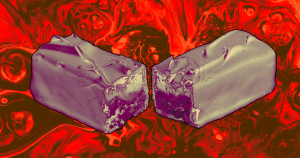 Mars used that data to develop a spicy Snickers bar, seasoned with Sichuan peppercorn. According to Bloomberg, Mars typically takes years to fine-tune a new product — but using the Alibaba data, it developed the new Snickers in less than one. Digging through a giant pile of customer data in search of a hidden, surefire niche sounds like it could stamp creativity out of product development. But for the time being, big data is unlikely to lead to the next truly revolutionary idea.